Here's some more old stuff my sister found at our parents house that I had overlooked. 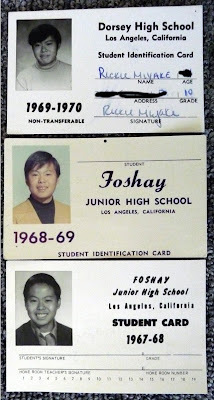 There was a box of various little things, including these student I.D. cards that I forgot we used to carry. In the first picture you can see the progression (from bottom to top), from a more neat, Ricky Ricardo look to a disheveled informal look because my hair wouldn't stay put, to the hairstyle-like-a-beret look. Then everyone thought the next picture was taken in elementary school. I said no, that's tenth grade because I remember that green "safari" jacket. 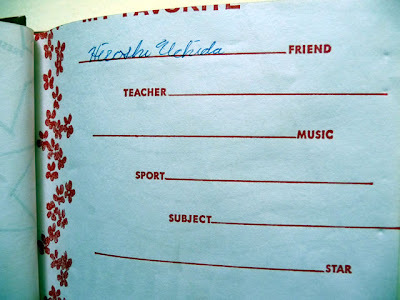 Turns out it wasn't tenth grade; looking at the date on there would fix it during my senior year in high school. My face looks rounder than I remembered from back then but quickly the explanation came to me - those were the days of frequenting Bob's Big Boy! 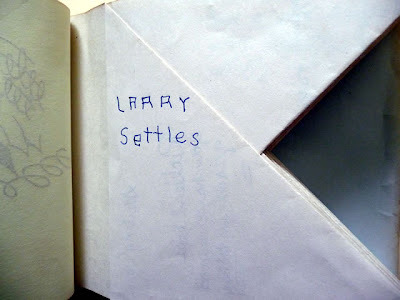 Then I came across an autograph book from the 6th grade. 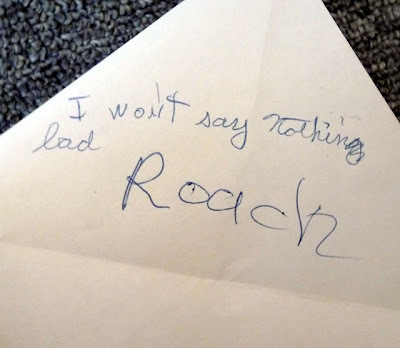 Below is the very first autograph I got. I remember this guy. I remember him because I didn't know him at all but he saw I was carrying an autograph book and asked if he could sign it so I gave it to him. He didn't write anything except his name. I looked at the other autographs and saw many names that I didn't recognize and some I remember but hadn't thought about for a long time. Here's a few choice pages. First one is the front page of assigning roles to people. I don't know if that was supposed to reflect the present status of the people or what I thought the future held. 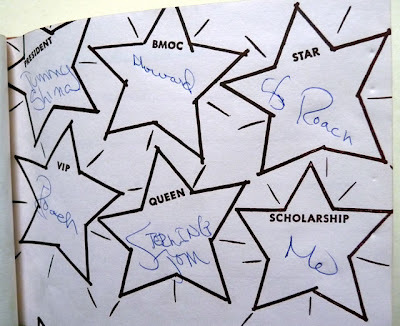 I guess I must have felt academics was more important than being a star or VIP (still do).. Howard Tamanaha is listed as "BMOC" because he was the shortest kid in class. I'll refrain from commenting on some of the other choices. Here's the page after. Hiro (or "Roach" as we called him) was my best buddy at the time. 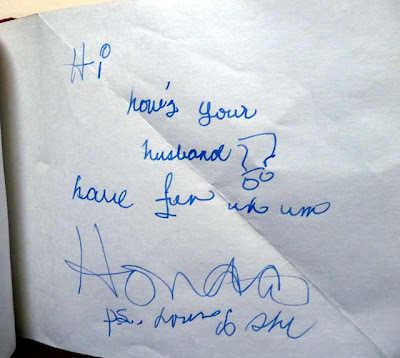 Here's what Hiro wrote on his autograph page. He's a teacher now but he ain't no English teacher so his grammar ain't nothing to worry about. Keith Honda was his typical smart-aleck self. 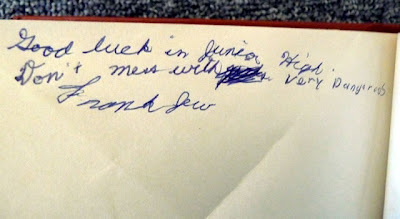 I can't decipher everything he wrote, though. Seeing as how he now is in politics and works for his relative who is a democrat, I ought to blackmail him with his politically incorrect humor and let the dirt hunter and gatherers drag up an innocent remark from over 40 years ago to smear his character and show why even his relative Mike is unfit for public office due to guilt by association. Here's an interesting comment from Frankie Jew. I don't know if he scratched out the word "girls" or I did or someone else did but it was a pretty odd thing to write back in the 6th grade. He was our class expert on the Ian Fleming James Bond novels so perhaps he was trying to impart wisdom to me based on his having read the likes of Goldfinger, Thunderball, etc. I remember Frankie used to wear shirts that were made from two different patterns - one pattern/color on the left side and a different one on the right. That could be helpful if he ever became a bank robber because witnesses would offer conflicting police reports depending on their perspective. "He was wearing a BLUE shirt, I tell you!" "No, it was RED!!" Anyway, I think we all learned later in life the truth of Frankie's words! 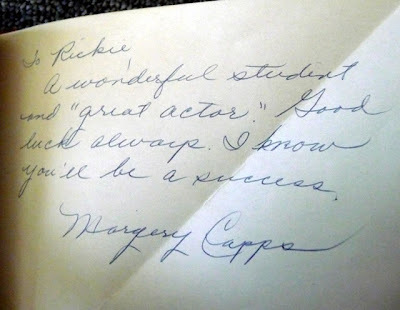 Finally here is an autograph from Mrs. Capps. I assume her reference to my being an "actor" is to my ill-fated appearance on the Art Linkletter show. I haven't seen most of my classmates from that class in ages but I know Mrs. Capps would have been very pleased with the overall results. Surprised at what people wound up doing, maybe, but nevertheless pleased. She helped us take giant steps forward.